If you are looking for THE FASTEST WAY to reach the level cap with a Templar, this ESO Dragon Knight Guide is a definite must have! There is nothing that comes even close in regards to level of detail and overall quality for this class. Dragon Knight (DK) is a cool fighter who uses the ancient Akaviri martial art tradition of battle-spirit. The most dangerous weapon in a DK's arsenal is fearsome magic that damages, stuns and controls the target enemy. The class can deal a lot of damage, combining different weapons, special abilities and magic. Furthermore, if you equip a sword and shield a DK can also be a good tank. 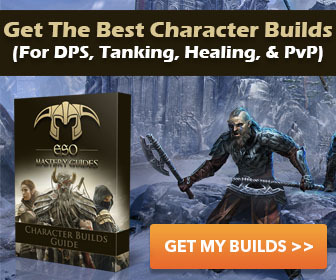 If you wish, you can even become an assassin or ranged damage dealer. It is a multipurpose class that is playable with any weapon and armour set. Everything depends on your wishes, which is the beauty of ESO. The class also feels comfortable in massive battles because of his Spiked Armour and Dragon Armour (ultimate ability) skills. Kindling Increases the damage of burning effects applied by fire abilities. Warmth Snares the target affected by Fire Magic of Dragon Knight. World in Flames All AoE fire-based spells deal more damage. Dragon Leap Leap forward on magical wings, dealing AoE damage upon landing, knocking nearby enemies backwards. Iron Skin Increase the amount of damage you are able to block. Magma Armor Sets a percentage based limit to the incoming damage you can receive per hit while dealing fire damage to all nearby foes. Molten Weapons Incrases weapon damage of nearby allies. - Bonus increased by 100% on caster. Obsidian Shield Creates a stone shield around the character and his nearby allies that absorbs a portion of incoming damage. Shield strength increased by 100% on caster. Draconic Power centers more on self healing & slightly boosting defense. Ardent Flame centers more on DOT & raw damage. Earthen Heart centers more on CC & boosting defense. Cant wait! I am wanting to use Earthen Heart and Ardent Flame mostly. Some of the Draconic Power abilities sound cool, especially Dragon Leap, but I am more interested in Earth and Flame based abilities. I'm actually glad I started playing ESO so late, its given everyone time to figure out what some of the best builds are lol. I just made it to level 10 so far I'm using a combo of all three skill trees but I'm really trying to narrow that down to only two with maybe one or two skills from the third. Anyone have any tips or ideas on what skills work best together? I'm aiming to play dps role as mainly a caster.